They can conduct electricity and heat. They can be formed easily. They have a shiny appearance. Most metals are solid at room temperature, but this does not have to be the case. Mercury is liquid. Alloys are mixtures, where at least one part of the mixture is a metal. Examples of metals are aluminium, copper, iron, tin, gold, lead, silver, titanium, uranium, and zinc. Well-known alloys include bronze and steel. The study of metals is called metallurgy. Most metals are hard, shiny, they feel heavy and they melt only when they are heated at very high temperatures . Lumps of metal will make a bell-like sound when they are hit with something heavy (they are sonorous). Heat and electricity can easily pass through a metal (it is conductive). A lump of metal can be beaten into a thin sheet (it is malleable) or can be pulled into thin wires (it is ductile). Metal is hard to pull apart (it has a high tensile strength) or smash (it has a high compressive strength). If you push on a long, thin piece of metal, it will bend, not break (it is elastic). Not all metals have these properties. Lead, for instance, is very soft, and heat and electricity do not pass through iron as well as they do through copper. 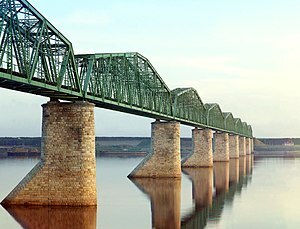 A bridge in Russia made of metal, probably iron or steel. Metals are very useful to people. They are used to make tools because they can be strong and easy to shape. Iron and steel have been used to make bridges, buildings, or ships. Some metals are used to make items like coins because they are hard and will not wear away quickly. For example copper (which is shiny and red in color), aluminium (which is shiny and white), gold (which is yellow and shiny), and silver and nickel (also white and shiny). Some metals, like steel, can be made sharp and stay sharp, so they can be used to make knives, axes or razors. Rare metals with high value, like gold, silver and platinum are often used to make jewelery. Metals are also used to make fasteners and screws. Pots used for cooking can be made from copper, aluminium, steel or iron. Lead is very heavy and dense and can be used as ballast in boats to stop them from turning over, or to protect people from ionizing radiation. People first began making things from metal over 9000 years ago, when they discovered how to get copper from its ore. They then learned how to make a harder alloy, bronze, by adding tin to the copper. About 3000 years ago, they discovered iron. By adding small amounts of carbon to iron, they found that they could make a particularly useful alloy – steel. In chemistry, metal is a word for a group of chemical elements that have certain properties. It is easy for the atoms of a metal to lose an electron and become positive ions, or cations. In this way, metals are not like the other two kinds of elements - the nonmetals and the metalloids. On the periodic table, we can draw a straight line from the element boron (symbol B) to the element polonium (symbol Po). The elements that this line passes through are the metalloids. The elements that are above and to the right of this line are the nonmetals. The rest of the elements are the metals. Most of the properties of metals are due to the fact that the atoms in the metal do not hold onto their electrons very tightly. Each atom is separated from the others by a thin layer of valence electrons. However, some metals are different. An example is the metal sodium. It is soft, melts at a low temperature, and is so light, it floats on water. People should not try this though, because another property of sodium is that it explodes when it touches water. Most metals are chemically stable, and do not react easily. (Some of the metals do react. These are the alkali metals like sodium (symbol Na) and the alkaline earth metals like calcium (symbol Ca).) When metals do react, they often react with oxygen. The oxides of metals are basic. The oxides of nonmetals are acidic. Nonetheless most elements on the periodic table are metals. Compounds, which have metal atoms combined with other atoms to make molecules, are probably the most common substances on Earth. For example, common salt is a compound of sodium. The use of metals is said to be the thing that makes people different from animals. Before they used metals, people made tools from stones, wood, and animal bones. This is now called the Stone Age. No-one knows when the first metal was found and used. It was probably what is called native copper, which is sometimes found in large lumps on the ground. People learned to make this into copper tools and other things, although, for a metal, it is quite soft. When it was melted over fire, people learned how to make an alloy called bronze, which is much harder and stronger than copper. People made knives and weapons from bronze. This time in human history, after about 3300 BC is often called the Bronze Age, that is, the time of bronze tools and weapons. Around the year 1200 BC some people learned to make iron tools and weapons. These were even harder and stronger than bronze and this was an advantage in war. The time of iron tools and weapons is now called the Iron Age . Metals have been very important in human history and civilization. Iron and steel were important in the making of machines. Gold and silver were used as money in order to allow people to trade, that is, exchange goods and services over long distances. Many people thought that finding metals was a way to get rich. There have been many times when gold was found and people moved quickly in large numbers to those places for example, Central and South America after the year 1500, and many places after the year 1800 (the United States of America, Canada, Australia, New Zealand and South Africa). These are often called Gold Rushes. In astronomy, a metal is any element other than hydrogen or helium. This is because these two elements (and sometimes lithium) are the only ones that form outside stars. In the sky, a telescope can see the signs of metals and then the astronomer knows that there are stars. This page was last changed on 12 November 2014, at 00:19.